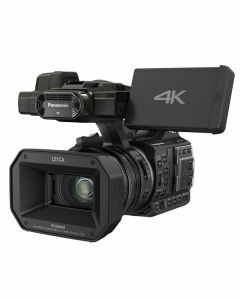 With HC-X1000, Panasonic takes the lead in 4K and UltraHD camcorders. It's a small, very well built camera with a range of codecs and formats that puts other models to shame. UltraHD at 50/60fps, DCI 4K at 24fps and HD recording at 200Mb/s. Plus, it's got great professional features including ND filters, triple lens rings and a superb Leica 20x zoom. This is where the 4K revolution really begins.